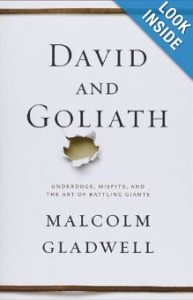 I recently read “David And Goliath: Underdogs, Misfits, and The Art of Battling Giants” by Malcolm Gladwell. Below are the quotes I found most useful (the page numbers in this case are the large print edition, which I got by accident). As always, if you like the quotes, click here to buy the full book. “When people in authority want the rest of us to behave, it matters – first and foremost – how they behave.